- with White Mountains Attraction "Reviews"
+ New Hampshire Fall Attraction "Reviews"
All pictures have descriptive captions and Recommendations, "Reviews," or Tips on the Attraction, Mountain Fall Foliage Viewing Drive, or "Must See" Scenic Day Trip. Have a Favorite "Must See" New England Fall Attraction, Day Trip, Scenic Drive, or Place? "Rave" or Share it with our Site Visitors on the easy fill-in form below. "Must See" Day Trips & Attraction "Reviews,"
New England Fall Foliage "Must See's"
The New England White Mountains area is a great choice for beautiful Fall Foliage Viewing Vacations. Some good lodging options around scenic Lake Winnipesaukee or up near Mt. Washington - plus many nearby attractions and scenic Day Trips. See larger approximately 5 x 7 size free downloadable versions of most pictures on this page on our New England Fall Foliage Picture Album - Screensavers / Wallpapers page. Share your own New England Mountains Fall Favorite below! + see the "Must See's" other Site Visitors have shared. Small lake was called Lilly Pond - on the Scenic drive across the Kancamagus Highway (#112) mountain road between Conway and Lincoln NH in the White Mountain National Forest. Saw spectacular New England Fall Foliage colors! If you can, do this 34.5 mile Scenic Mountain Fall Foliage viewing drive once at the beginning of your Fall Foliage Vacation stay, and a 2nd time several days later, or near the end of your stay. You will be amazed at the difference in the Fall Foliage Colors you will see! We have discovered driving the Kancamagus Highway the opposite direction the second time gives an even different viewing perspective. The Lincoln Woods Visitor Center has helpful information on the area - located 5 miles east of Lincoln, NH. Highly recommend taking the Kancamangus Hwy Scenic Drive! - take plenty of film or digital memory cards! This link goes to the USDA Forest Service White Mountain National Forest web site with much information on the park and New England fall foliage color updates. Read candid user reviews and see 7 Laconia, NH Hotels & Resorts ranked by popularity with comparison pricing at: Compare prices and read what other travelers have to say about the Summit Resort + other hotels and Inns in Laconia, New Hampshire - Hotels & Vacation Condo Rentals for great Mountain Fall Foliage vacations. We were a few miles south of Squam Lake where the movie "On Golden Pond" was filmed. See one of our Site Viewers Picture and Best New England Fall Vacation story - including colorful Fall drives on the Kancamagus Highway in the White Mountains - Jim could end up winning a prize for his Vacation "story" in our New Top "Raves, Rants, & Reviews" Contest. 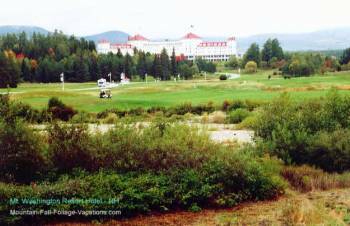 See the description of a Site Visitor from the United Kingdom of a Beautiful Scenic Road Trip from Rangeley Maine to North Conway New Hampshire down Route 16..
White Mountains Resort Top Picks - Our "Reviews" of North Conway + Lincoln Vacation Resorts in New Hampshire. Large size versions of most pictures on this page are on our New England Fall Foliage Picture Album page. Beautiful drive up to top of "mountain" -- 5,500 Acre country estate built in 1913 by shoe mogul Thomas Plant. Brought in over 1,100 Italian stonecutters and masons to build the castle. Has modern conveniences not typically found in homes built at time of construction. Many interesting Antiques. Also is called the Lucknow Estate. Guided Tours are available. Panoramic views in every direction including great views of Lake Winnipesaukee which covers 72 square miles and has 183 miles of shoreline. Well landscaped grounds in middle of forest with waterfall near entry road on way up to parking area at Stables where there was a restaurant and a small museum. Then Trolly cars take you on up to the top of the mountain to the Castle in the Clouds attraction and grounds. There are 45 miles of scenic hiking trails on the property which also can be accessed from from a parking area with an information Kiosk off of Hwy 171 just east of the Castle in the Clouds entrance. 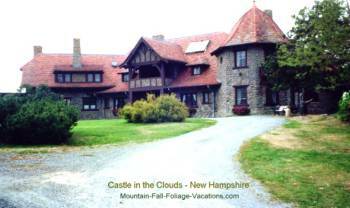 This "Official" Castle in the Clouds Web Site has many pictures and interesting facts about how the Castle was built and it's history plus hiking trail Info and current open dates and times. Also a map link. The site is managed by the Castle Preservation Society. This link goes to some pages on another web site with additional interesting history and more pictures from The Castle in the Clouds. It is a very photogenic place! See one of our Site Viewers Picture and comments on The Castle in the Clouds on this new "Our Favorite Attraction on Lake Winnipesaukee" Page. From Lois from Texas. You can even make your own comments about the Castle in the Clouds -- or comment on their comments about it. Share your own New England Fall Foliage Favorite below! Great for a "Must See" stop on a New England Fall Foliage Vacation Day Trip circling Lake Winnipesaukee. The Castle is on the east side of the lake. Allow about 2 hours to view. Tip -- Walk the easy and very scenic 4-5 minute walk back down from the Castle to the Restaurant, Gift Shop, and Parking area Vs taking the Trolly back down from the Castle. There are some great views and photo opportunities looking back up at the Castle! Very narrow road with no fences along straight down mountain drops along edges. Meeting cars on road was a "white knuckle" experience. Buy the narritive CD or tape which describes what you are driving by and has several marked stopping and viewing points along the way -- makes the drive more interesting, and even has some driving tips for the narrow mountain road. First recorded ascent was in 1942 - Indians wouldn't climb "sacred peak." Average temp at top is 26.9 degrees. Mt. Washington snowfall averages 195 inches annually. There is a big weather research station, several TV and Radio antennas, a museum, and of course a snack and gift ship on top. 6,288 ft. elevation. Gusts above 100 mph are recorded every month of year. Average wind speed at top is 35 MPH so plan on a bad hair day. 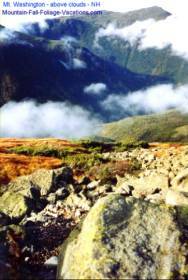 This link goes to a comprehensive web site on everything about Mount Washington with much information and more pictures on the Mt. Washington Auto Road and the Cog Railway in the New Hampshire White Mountains. HUGE beautiful 100+ year old Hotel - Resort opened in 1902. Near Bretton Woods, NH. Built by rail road baron Joseph Stickney. Spectacular 200 room Historic Resort Hotel still in use. Very well maintained - beautiful views of nearby White Mountains and grounds including 27 hole golf course. Do the free tour! Read candid user reviews and see 3 Bretton Woods, NH Hotels & Resorts (Including the Mt Washington Hotel Resort) ranked by popularity with comparison pricing at: See User Reviews + compare prices and read what other travelers have to say about Bretton Woods, New Hampshire Hotels & Vacation Condo Rentals. See more Info and pictures of the Mount Washington Hotel on our New Hampshire Mt Washington Hotel page plus a Mt Washington Resort Hotel link with pictures and additional area New England Fall Foliage Vacation and rental information. Self guided tours are available - even though the Mount Washington Hotel is a "Working Hotel." The Resort Hotel is close to Mount Washington mountain, above, so it is short drive over - definately worth the drive! See an interior Hotel Picture, plus the comments of one of our Site Viewers - Jerry in Oregon - about how the Mt Washington Resort Hotel is her and her husband's favorite Historic Attraction in New Hampshire. Franconia Notch State Park and The Flume Gorge - North 6 miles from North Woodstock, NH on I-93 where road turns into Franconia Notch Parkway for approximately 8 miles. Hwy 3 crosses through the area. Between tall Kinsman and Franconia mountain ranges - spectacular scenery. 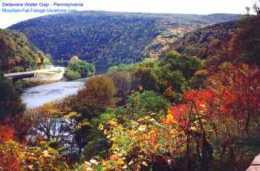 Flume Gorge is in this area, along with what is left of the "Old Man of the Mountain" rock formation above Profile Lake. Many scenic viewing spots. 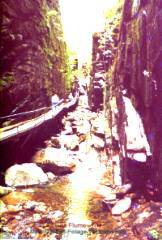 In The Flume Gorge, vertical walls on sides rise up to as much as 90 feet above the Gorge floor. You can walk along a boardwalk through the gorge and then can walk a nature trail through the woods. The Flume Gorge and Franconia Notch State Park are a "Must See" New England Attraction for your New England Fall Foliage vacation. See approximately 5 x 7 size free downloadable versions of all pictures on this page on our New England Fall Foliage Picture Album - Screensavers / Wallpapers page. + see the "Must See's" Others have shared. White Mountains Resort Top Picks - "Reviewed" North Conway + Lincoln Vacation Resorts in New Hampshire. Do You have a Favorite "Must See" New England Fall Foliage Vacation Attraction, Scenic Drive, Day Trip, or Place? This page has the "Must See's my Wife and I can vouch for, but I am sure there are other New England Fall Foliage Favorites many Fall Vacationers have discovered that are not listed above -- or additional reasons to definately not miss the Favorites listed above. "Rave" -- or just share -- a little about your personal "discovery" or favorite below so others will definately put it on their "Must See" List and will not miss the fun of seeing it that you had. -- Or - Your reasons not to miss one of the "Must See's" on the list above so others will know how great it really is! 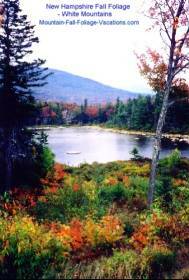 Do you have a Favorite New England Mountains Fall Vacation "Must See"? Share it with the viewers to this page + your Tips! Your New England Fall Vacation Favorite "Must See" story will appear on a Web page almost exactly the way you enter it here. You can wrap a word in square brackets to make it appear bold. For example [my story] would show as my story on the Web page containing your story. Re: Free Picture Downloads and Copyright - You are welcome to use pictures above or the larger versions of them on our New England Fall Foliage Picture Album page or other pictures on this Site to download and print or to use as Wallpaper or Screensavers as long as the Mountain-Fall-Foliage-Vacations.com Domain Name or other domain name text remains visibly displayed unaltered and readable on the image as it is on pictures above and on larger picture versions on other pages. Resale of these images or pictures in any form or use on another web site without our permission is a violation of our copyright. Please send us any Comments or Suggestions you might have for this Site to us using this Gene Seecann Sites Comment Form. If you have any personal New England Fall Foliage Vacation Favorites or Pictures you would like to share, please send them using our Comments Form above. To Mountain Fall Foliage Vacations Home Page - Affordable Mountain Fall Foliage Vacations - Including Scenic New England Fall Foliage Vacations and New Hampshire Fall Foliage Vacations + Colorful White Mountains Autumn Foliage Viewing areas.